Limbongan Maju Sdn Bhd is a popular ferry company in Malaysia that provides ferry services from Tanjung Belungkor Ferry Terminal at Desaru, Johor Bahru to Singapore’s Changi Ferry Terminal with return trips as well. This company has been appointed by Johor Port Authority as the exclusive ferry operator which operates the short crossing for routes in the south of Peninsular Malaysia since 2012. 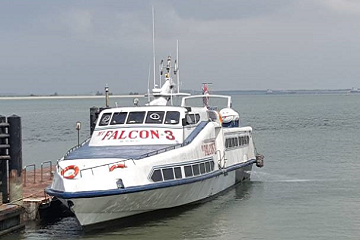 If you plan to travel within Singapore and Johor Bahru, booking your ferries with Limbongan Maju is a great option as it provides safe, reliable and efficient marine transportation services. Besides ferry ticketing, they also developed tourism development business providing ground arrangements as well as accommodation and bicycle bookings. Come and experience amazing ferry services by Limbongan Maju when you purchase the tickets at Easybook platforms either on our website that can be done within a few minutes through a few simple steps. You can also download our free mobile app to your devices for faster results. Ferries from Tanjung Belungkor Ferry Terminal operate twice a day and four times on weekends and public holidays. Check out the schedule below for trips between Tanjung Belungkor Ferry Terminal and Changi Ferry Terminal. Limbongan Maju ferries capacities can carry up to 120 passengers per trip, and it takes approximately 30 minutes to travel, but this also depends on the condition of weather and sea. The facilities on board also limited due to the short length of the trip. The ferry terminal at Tanjung Belungkor was officially launched in 1993 and it was mainly to promote tourism development at Desaru in Johor Bahru. It takes around 30-minutes’ drive from the port to Desaru town. Meanwhile, Changi Ferry Terminal in Singapore is located a few miles east of the airport on the beach-lined coast. Travellers can get a lot of assistance and helpful information such as nearby hotels and restaurants nearby, at the customer information kiosks within the terminal. You can also choose to fill up your stomach at Changi Village Hawker Centre located within walking distance. Desaru is a popular destination in Kota Tinggi District, Johor Bahru which is known for its clean beaches and natural forests. There are various attractions such as the Desaru Beach, Fishing Village Museum at Tanjung Balau, Desaru Fruit Farm that get plenty of visits by tourists from all over the world. After visiting Desaru Beach that has a huge beautiful view of the sea, you can move on to try out over 100 varieties of tropical fruits in Desaru Fruit Farm or take this amazing opportunity to watch fireflies at lightning bugs at Sungai Lebam later in the evening. Animal lovers can check out Ostrich Farm to get up close with the ostriches and learn a few things or two about these flightless birds. Take note that Desaru is monsoon season between November and February. The best period to visit is between April to October, visitors are able to enjoy the fine weather and sunshine during their holiday. Travelers are recommended to book the ferry ticket in advance to avoid disappointment especially during the peak seasons. They also encourage check-in with you own passports, so make sure to also bring along a printed copy of the order summary to collect your boarding passes at least one and a half hour before ferry departure time. If you are looking to spend a night at Desaru, there are a plenty of options for travelers to choose from according to their needs. Many great resorts can be found here such as Pelangi Balau Resort, Sebana Cove Resort, Lotus Desaru Beach Resort, Punggai Beach Resort or Pulai Desaru Beach. You can enjoy a leisurely retreat with the perfect beach front view and comfortable stay with your family or friends. For those who prefer getting budget accommodations, Desaru Holiday Chalets, Tiara Desaru Seaview Residence and Amansari Hotel Desaru are also available at affordable rates. Do check with the hotels you have booked with if they provide pick-up services from the ferry terminal to ease up your travel plans. Create new memories at Desaru upon booking Limbongan Maju ferry ticket online with Easybook! After you have purchased your tickets from Easybook website or mobile app, make sure you print out the order summary for a speedier process when you present it at the departure points. Happy travel and we look forward to serving you soon!